These Farm Heroes level 97 cheats and tips will help you beat level 97 of Farm Heroes. 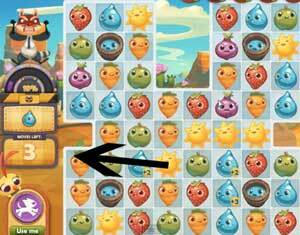 The objective of Farm Heroes level 97 is to create as many water droplet matches as you can to vanquish Rancid the Raccoon. You will only have 28 moves to complete this task. This is a Rancid level! To defeat him you are going will need to match as many water droplets as possible to drop his meter. 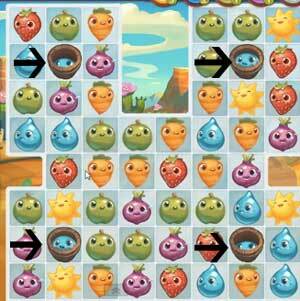 Unfortunately, you need to overflow the level’s 4 buckets to create water droplets. So start the board by making matches alongside the buckets. Remember 3 matches will grant you 4 droplets of water! Level 97 Cheat #2: Don’t waste your moves! The only thing you need to worry about in this level is water droplets and water buckets. So try and ignore every other cropsie on the board so you don’t waste any moves. Remember, you only have 28 to complete your objective. If you are having trouble getting rid of the nasty raccoon, you can always use your magic beans. 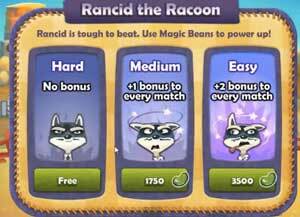 The magic beans can be used to power up and make matches much more powerful to defeat Rancid. By using 1750 beans, you will add +1 1 bonus to every match. For 3500 beans, you can you can add +2 bonus to every match.